Two questions remain unanswered in the minds of most Indonesians as the presidential election approaches. The first question relates to the identity of Mr Joko Widodo's vice-presidential running mate. 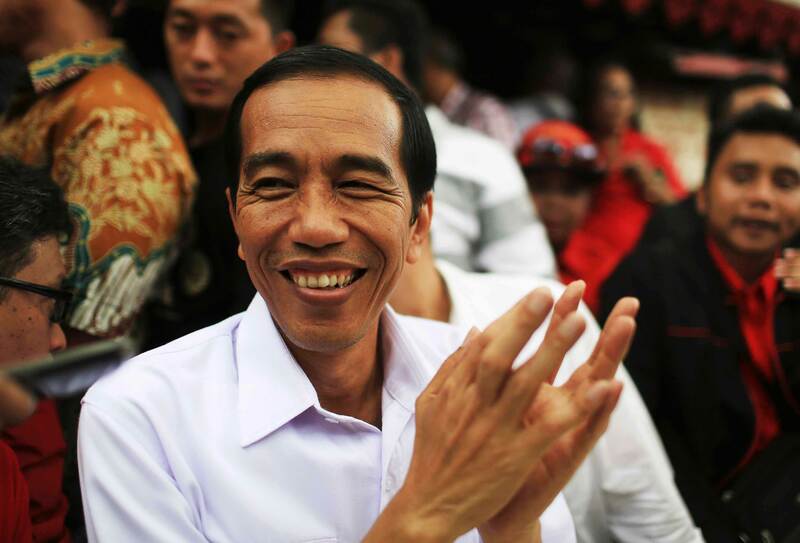 The second question is whether a strong rival will emerge to challenge Mr Joko in the presidential race. The two questions are related, of course. Both are also reciprocal. Indeed, it is possible to answer the latter by considering the first one carefully. I strongly believe that whether or not Mr Joko wins the 2014 presidential election will be determined by the choice of his running mate. Mr Joko has indeed been the strongest candidate. But no one can guarantee that there will not be tough competition ahead. 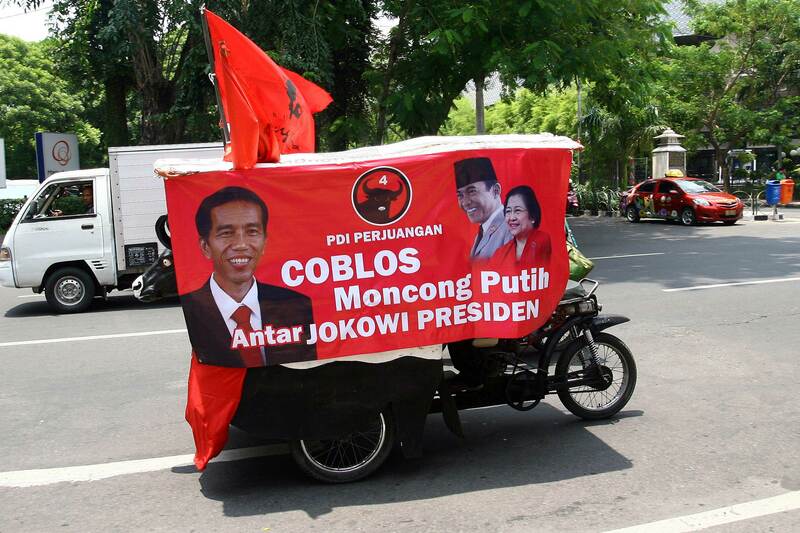 It would be difficult to campaign for Mr Joko if he isn't paired with a politically strong candidate. In such a situation, Mr Joko could be tragically beaten in a tight race. In this regard, I believe that Muslim and East Indonesian voters will be the determining factors. Who would be the right man? What criteria should be considered? Is the traditional dichotomy between civilian and military figures or Javanese and non-Javanese pairing still relevant? 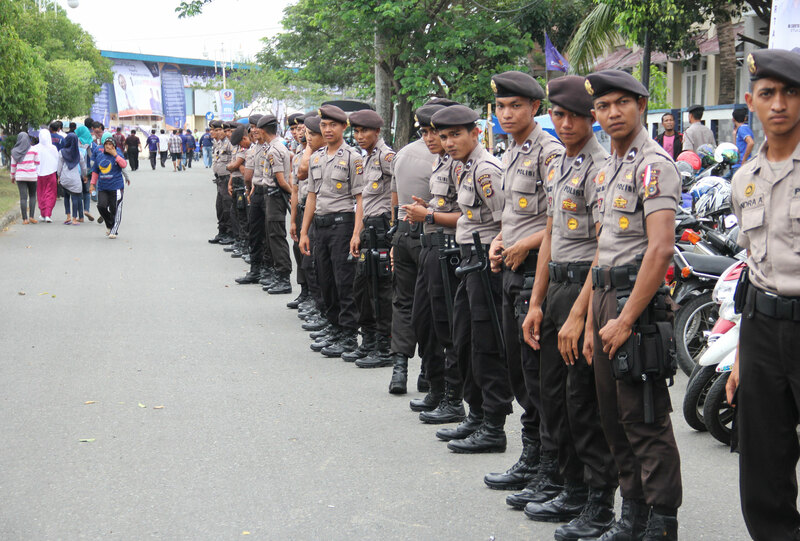 According to PolMark Indonesia's surveys, the pairing of a civilian and military figure, or the need for Javanese to be linked with a non-Javanese is no longer relevant. Less than 25 per cent of voters take such factors into consideration. It would also be unwise to apply such a dichotomy in determining the best partner for Mr Joko. Two other factors, however, are important: namely representation and function. Mr Joko will have difficulty winning in the so-called battleground provinces where his electability level is still under 20 per cent. Most provinces in East Indonesia fall into this category. Hence, in order to win here, Mr Joko should consider a figure who is very well accepted by voters in these provinces. According to PolMark's research, 71 per cent of Mr Joko's supporters live on the most densely populated island of Java. Only 29 per cent are outer Java inhabitants. In terms of regions, the number of Mr Joko's supporters in eastern Indonesian provinces is far fewer than in the western parts of the archipelago. Another issue to be considered is the potential resistance of Muslim voters towards his party, The Indonesian Democratic Party- Struggle (PDI-P) and its leader Megawati Sukarnoputri. 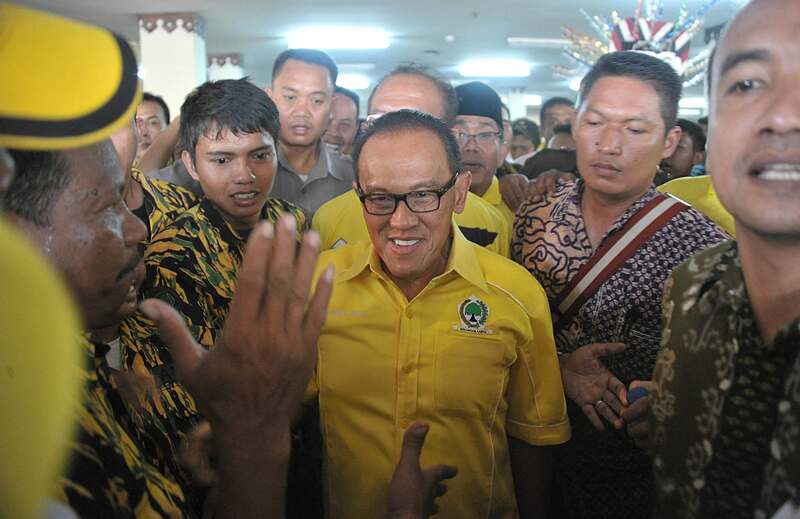 The PDI-P, Ms Megawati and even Mr Joko have often been perceived as "unfriendly" towards Muslim communities. 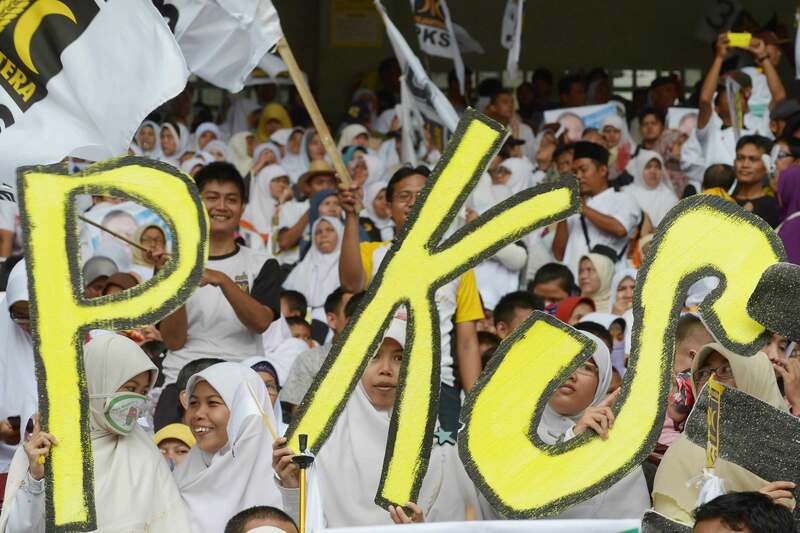 The PDI-P established the Baitul Muslimin organisation in order to gain more support from Muslim voters. But apparently that has not been considered adequate. Therefore, Mr Joko should look for a vice-presidential candidate who is not only very well accepted by the Muslim community but regarded as an iconic figure. 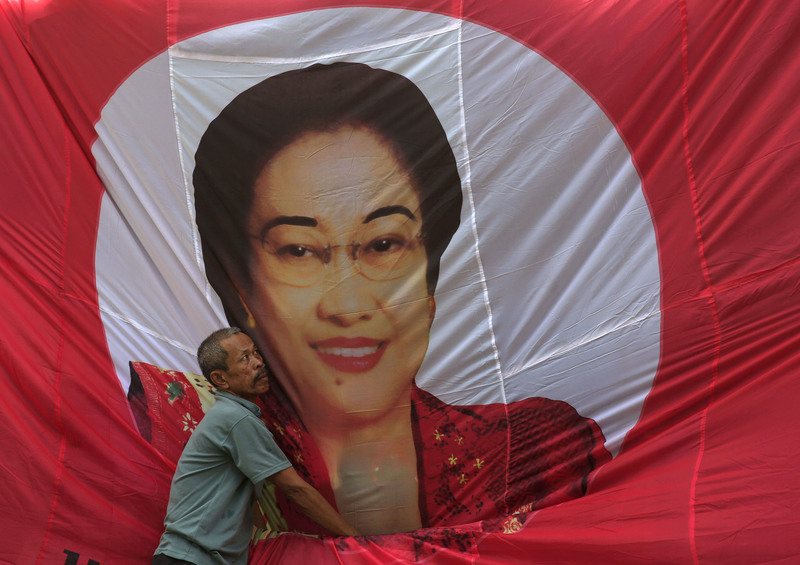 A man fixes a banner of Indonesia's former President Megawati Sukarnoputri, head of main opposition party Indonesian Democratic Party of Struggle (PDI-P), at Tanjung Priok slump area in Jakarta, February 28, 2014. 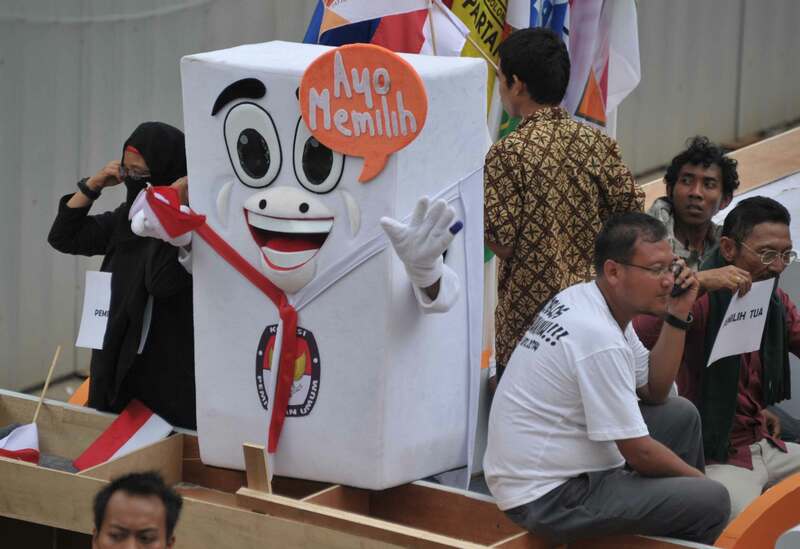 An election commission mascot takes part in a parade in Jakarta on March 15, 2014 to mark the opening of the legislative election campaign in Indonesia. 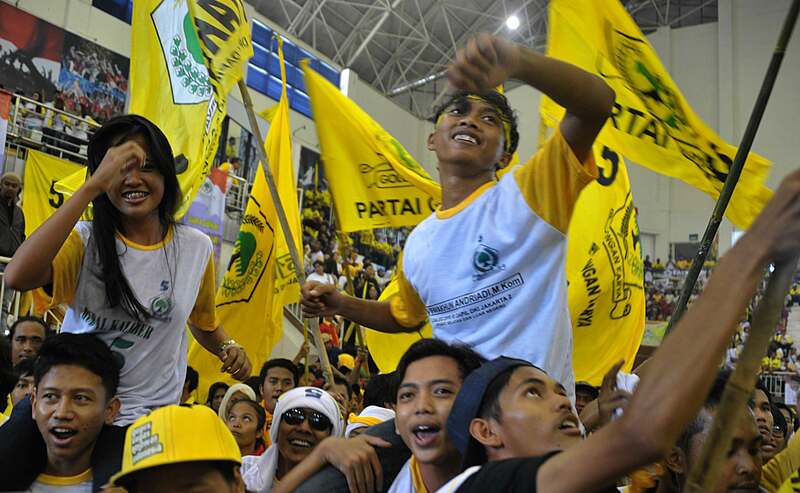 Indonesian supporters of the Justice and Welfare Party (PKS) attend a legislative campaign at Bung Karno stadium in Jakarta on March 16, 2014. 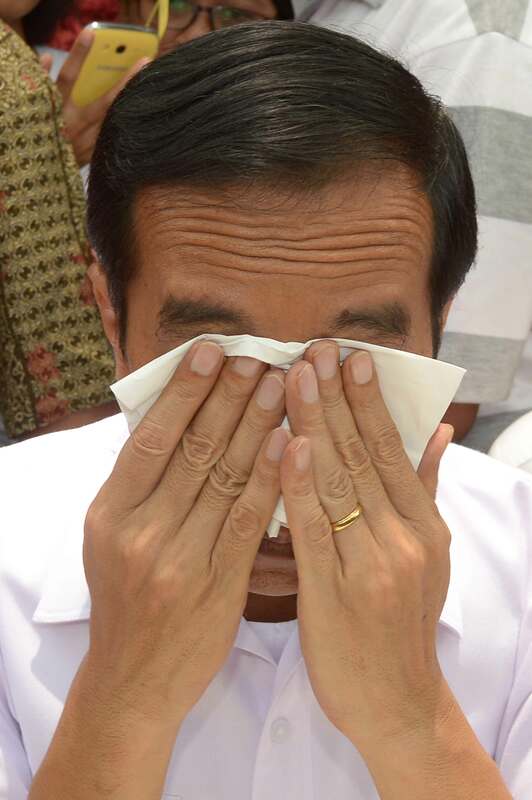 Jakarta Governor Joko Widodo, who is running for president for the Indonesian Democratic Party of Struggle (PDI-P), wipes his eyes as he speaks to journalists during a legislative campaign tour in Jakarta on March 16, 2014. 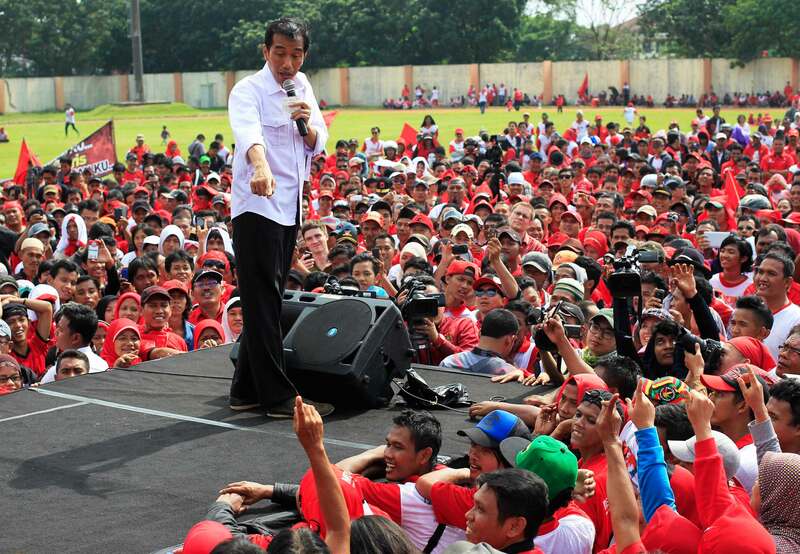 Jakarta governor and presidential candidate Joko Widodo, of the Indonesian Democratic Party of Struggle (PDI-P), speaks to supporters during a party campaign at Cengkareng soccer field in Jakarta March 16, 2014. 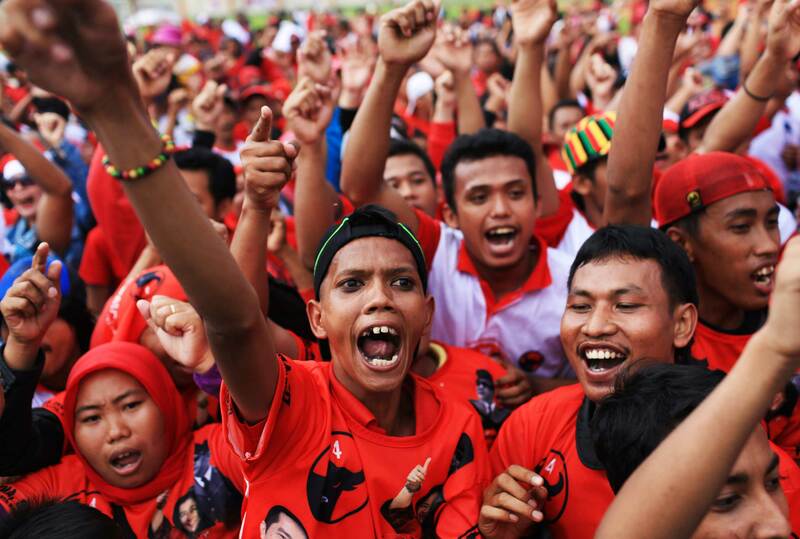 Supporters shout slogans during a Indonesian Democratic Party of Struggle (PDI-P) campaign at Cengkareng soccer field in Jakarta March 16, 2014. Jakarta governor and presidential candidate Joko Widodo, of the Indonesian Democratic Party of Struggle (PDI-P), reacts during a party campaign at Cengkareng soccer field in Jakarta March 16, 2014. 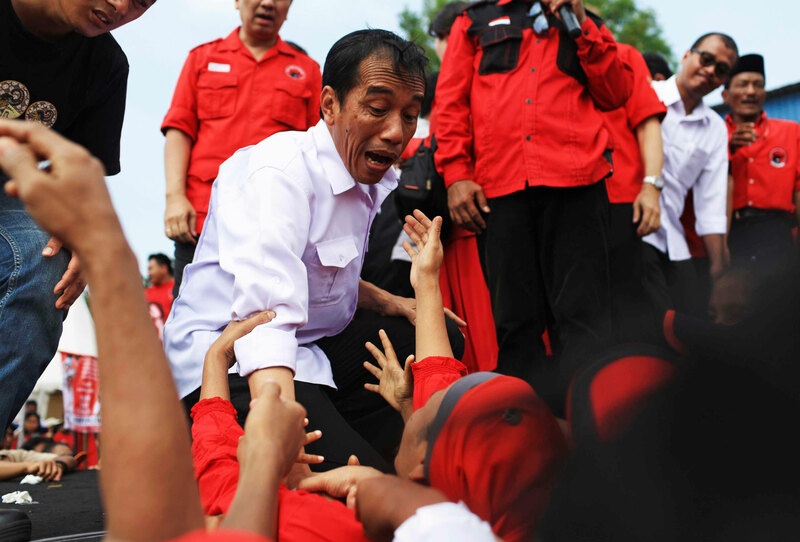 Jakarta governor and presidential candidate Joko Widodo, of the Indonesian Democratic Party of Struggle (PDI-P), interacts with supporters during a party campaign at Cengkareng soccer field in Jakarta March 16, 2014. A campaign banner bearing the portrait of Jakarta Governor, Joko Widodo, (L), the presidential candidate of Indonesia's main opposition party Democratic Party of Struggle (PDI-P) is carried on a motorcycle during the first week of the campaign for the legislative election in Surabaya, eastern Java island on March 17, 2014. 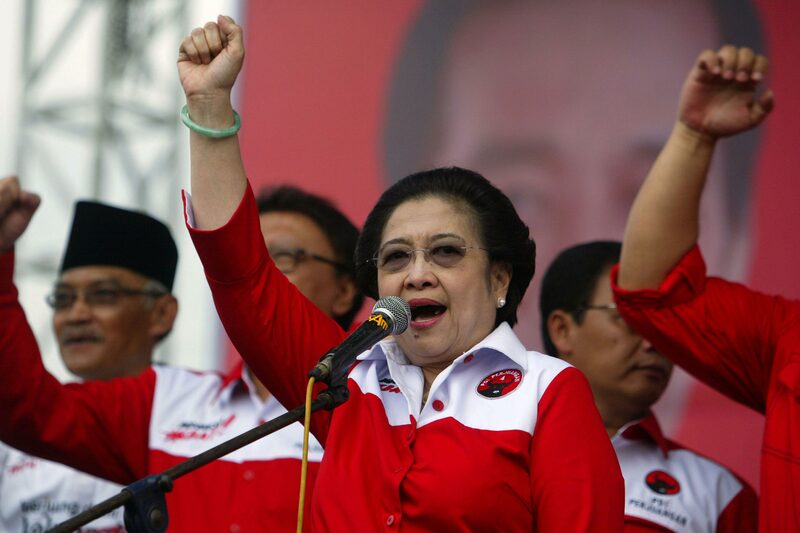 Former Indonesian president and party chairwoman of main opposition party Democratic Party of Struggle (PDI-P) Megawati Sukarnoputri leads a rally during the first week of the campaign for the legislative election in Surabaya, eastern Java island on March 17, 2014. Students at an election commission office in South Sulawesi sorting ballot papers for Indonesia’s general election on 9 April 2014. 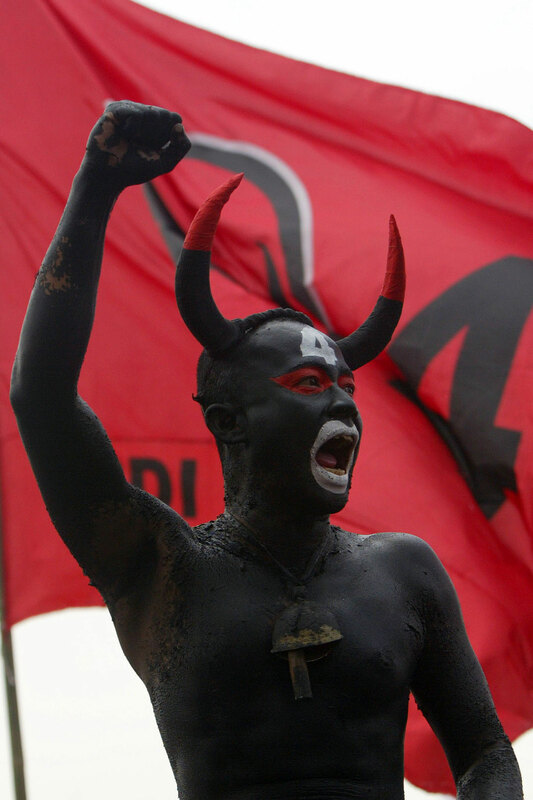 A supporter painted as the bull mascot of Indonesia's main opposition party Democratic Party of Struggle (PDI-P) shouts slogans in a rally during the first week of the campaign for the legislative election in Surabaya, eastern Java island on March 17, 2014. 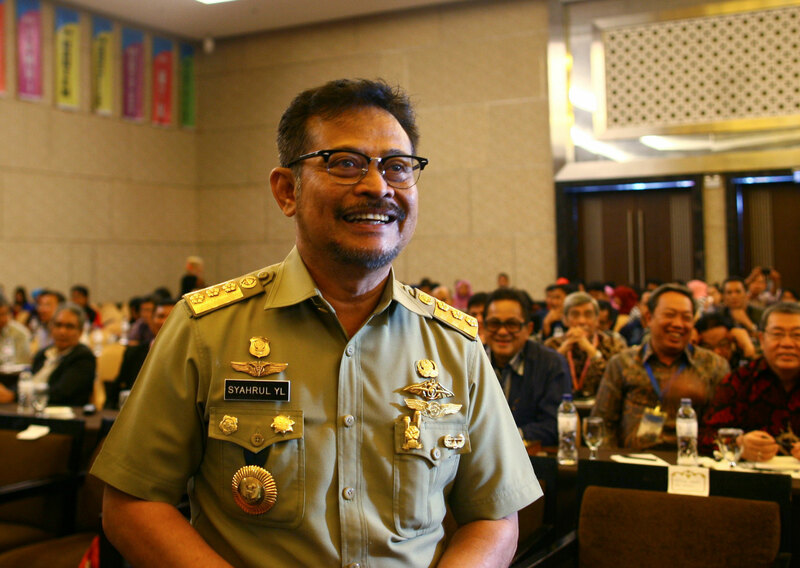 South Sulawesi governor Syahrul Yasin Limpo is pictured before meeting with legislative members in Makassar, March 14, 2014. 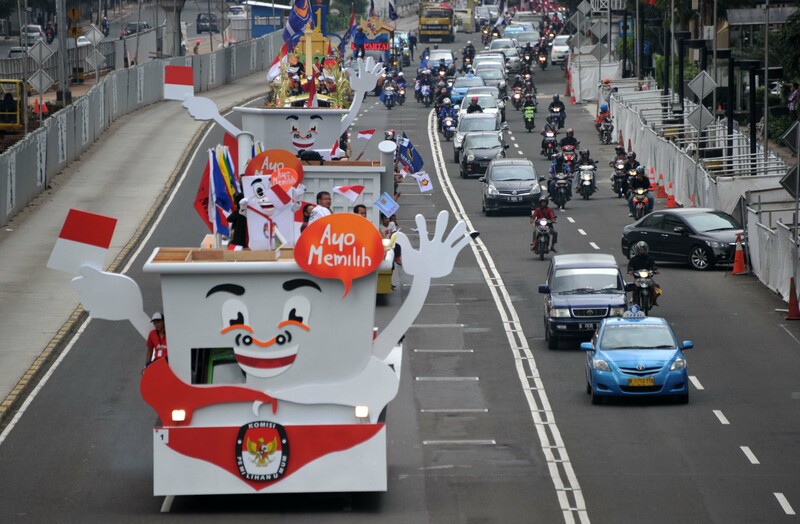 Ballot box floats participate in a parade in Jakarta on March 15, 2014 to mark the opening of the legislative election campaign in Indonesia. 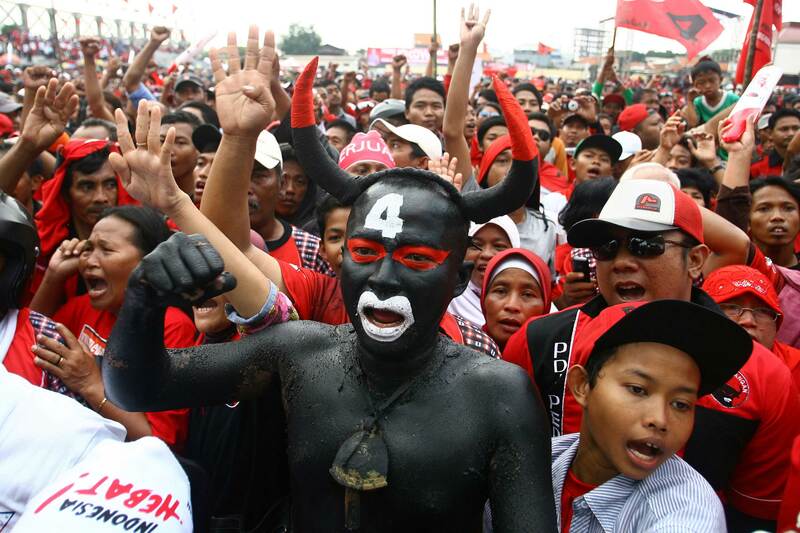 Indonesian supporters of the Justice and Welfare Party (PKS) in body paint role play as supporters attend a legislative campaign at Bung Karno stadium in Jakarta on March 16, 2014. 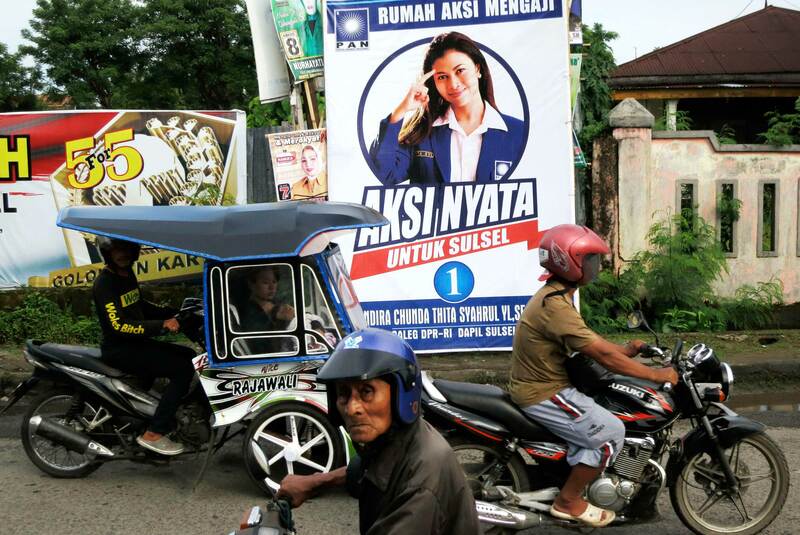 A man rides a motorcycle near a campaign poster for Governor Syahrul Yasin Limpo's daughter, Indira Chunda Thita, in Makassar. 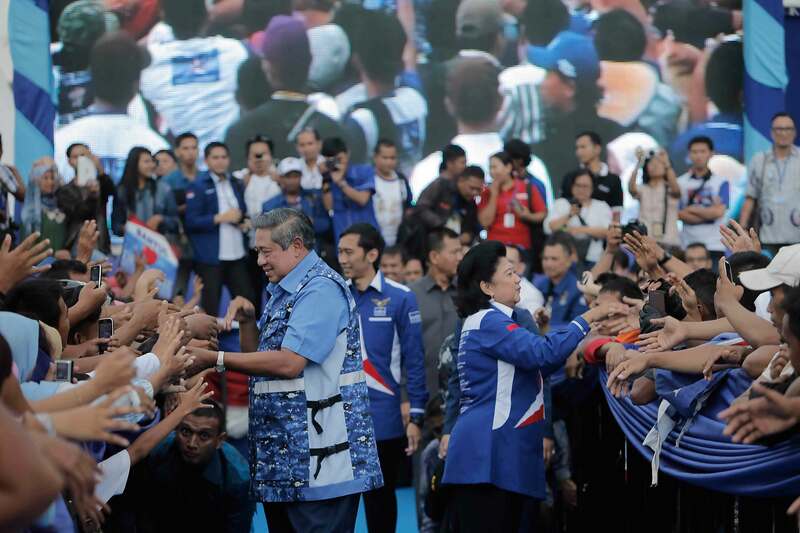 ncumbent President Susilo Bambang Yudhoyono, his son Eddy Baskoro Yudhoyono and First Lady Ani Yudhoyono greeting their supporters at the Democrat party's legislative campaign in Bantul, Yogyakarta. s Incumbent President Susilo Bambang Yudhoyono (front, right) and his son Eddy Baskoro Yudhoyono (front, left) leading the Democrat party's legislative campaign in Bantul, Yogyakarta. 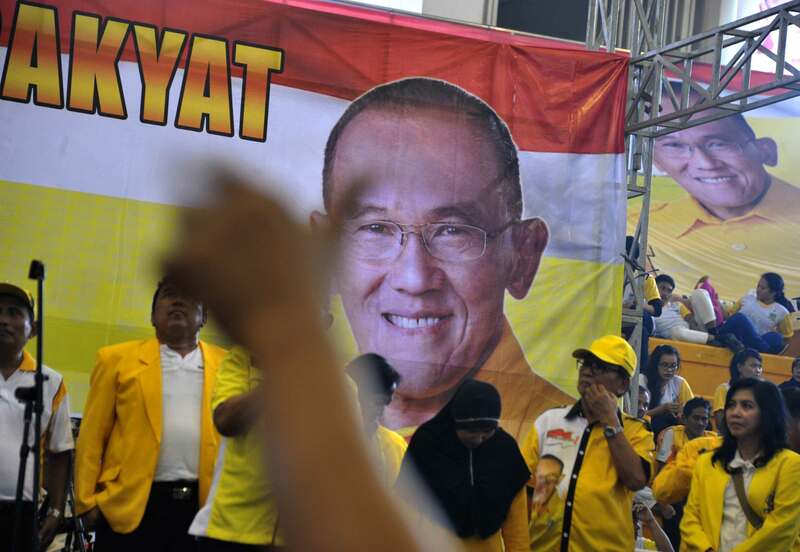 Supporters of the Golongan Karya (Golkar) attend a campaign party during the first week of campaigning for the legislative election in Jakarta on March 18, 2014. President candidate from the Golongan Karya (Golkar) party, an Indonesian tycoon Abu Rizal Bakrie, meets supporters during the first week of campaigning for the legislative election in Jakarta on March 18, 2014.
upporters gesture as politicians from the Golongan Karya (Golkar) party deliver speeches during the first week of campaigning for the legislative election in Jakarta on March 18, 2014. 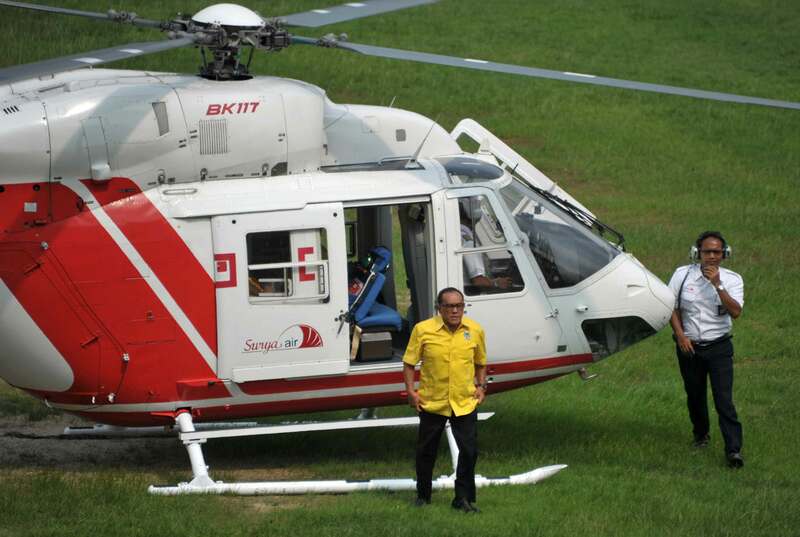 President candidate from the Golongan Karya (Golkar) party, an Indonesian tycoon Abu Rizal Bakrie, arrives for a campaign party by helicopter during the first week of campaigning for the legislative election in Jakarta on March 18, 2014.